GOLD, the bulls have the goal! I am ready, let’s move on! Despite US dollar strenght, the precious metal is holding very well and the bulls would like to reach 1135/40, the daily MA200. 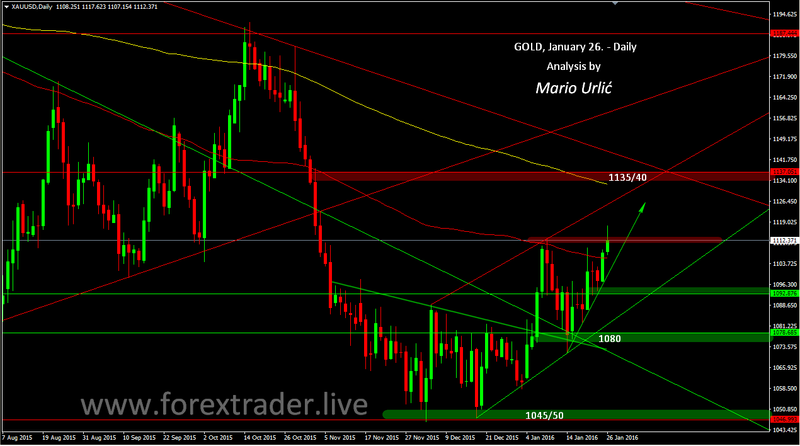 As I wrote in my previous gold analysis from January, daily MA100 and 1110/15 level was strong resistance, from where the sellers have returned the gold to 1080, but the buyers have took over there because of the strong technical support. You can see the three trend lines and previous resistance level from December is on that place. After onother attack on the MA100 from January 20. in which the bulls have failed, they have manage to do that yesterday and the braking of the moving average gave them additional boost today in which they have reached almost 1118. As you can see, there is several of resistances here, but the bulls are targeting 1135/40 and daily MA200, which I have already mentioned and that is how I see the furder development here for now. Let’s follow the moves and comment the same here. 1110/15 is still resistance and the bulls must close the day above at first.